Enjoy the flavoursome herbs and freshness of Tibetan and Nepalese cuisine in our cosy and warm family-run restaurant. Try our delicious dishes, freshly cooked in the traditional clay oven prepared with our homemade spice mixes. We have a variety of dishes, meat, chicken, fish, vegetarian and vegan, that will satisfy everyone’s taste. Grasp the delicate meals that will definitely leave you enchanted! Established in 2003, this restaurant is family run and owned. Bhim and Holly started this adventure as soon as they arrived in Adelaide, where they successfully brought an authentic Nepalese and Tibetan spirit. As the years passed, the Himalayan Kitchen family has grown and now the five of them run this family business together. Brochures to know more about ”Tibetan Support Group”. Samples of herbs, spices and coffee used in our restaurant. 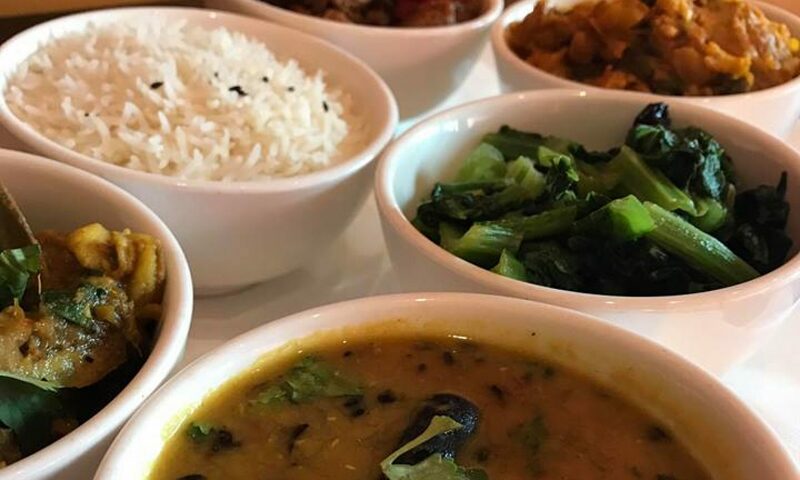 The restaurant has proven its excellence during the years and aims to bring to Adelaide the Nepalese and Tibetan spirit, cuisine and atmosphere. Not just with fresh authentic food, also living and participating in everyday Nepalese and Tibetan community events. The Nepalese and Tibetan culture is rich and unique, influenced by Indian and Chinese culture, but is quite distinct and fascinating. This complex and manifold heritage has different manifestation, from religion to art, from architecture to music. The Indian God of ‘New Beginnings’, is frequently honoured during ceremonies for blessings in Nepal, Sri Lanka and India. He is considered as the most well known Hindu God and is also recognised as a supporter of education. Ganesh Statue in Nepal that is being blessed and worshipped. Prayer flags were used for the first time in 800 CE in India, and have plain colours, representing the four elements. They are also covered in enchantments and prayers that represent the beauty that rises from sustaining a culture. They are hung on the mountains so when the cold wind blows, the blessings are passed all around the villages and towns. The prayer wheel can be seen quite frequently at any time in Nepal and Tibet. This cylinder shape contains religious inscriptions of blessings and enchantments that are released when spun in the right direction. “OM MANE PADME OM” is the incantation that is repeated on these objects and represents the meanings of tranquillity, peace, love, and care. These antique items are used, most commonly, for therapy, stress relief, relaxation, meditation and digestion. The certain designs that cover these beautiful objects signify strength, however, they all carry their own meaning. We encourage the use of singing bowls as we teach customers how to use them, after their meal. Om mane padme om represents the significance of tranquillity, peace, love and care. They all aid a person within themselves and who they are seen as.